“Spinal injections” are performed to reduce pain and inflammation associated with many back and neck related conditions. There is a range of different injections used depending on the specific diagnosis but most involve the use of a steroid which is a strong anti-inflammatory. In addition to treating pain and inflammation, “diagnostic injections” are used to confirm a diagnosis or identify the source of your pain. The injection you receive is based on your specific diagnosis through a detailed history, physical examination, and appropriate imaging studies. Trigger points are tense bands of muscle fibers that can be felt or “palpated” and produce pain when compressed. Trigger points are thought to be caused by an initial injury which activates sensory nerves (nociceptors) resulting in a localized muscle contraction. Prolonged contraction may produce localized tissue ischemia and inflammation (with accumulation of inflammatory agents such as serotonin, histamine, and prostaglandins). These changes then feed a cycle of increasing pain stimulation and motor response which is thought to be dependent on central sensitization in the spinal cord. Prolonged “sensitization” is believed to be the major source of chronic pain syndromes and a major rational for treating the initial injury aggressively with anti-inflammatory agents (NSAIDs, steroid injections). If a trigger point or “hot pot” is found it can be treated with a localized injection centered on the tender trigger point. The injection usually includes an anesthetic which blocks the sensory (nociceptive) fibers resulting in muscle relaxation and a steroid which decreases the localized inflammatory response thereby breaking the pain cycle at several points. The steroid may cause an elevation in blood sugars in diabetic patients or increase risk for infection especially in immune compromised patients. Fat atrophy has also been reported. 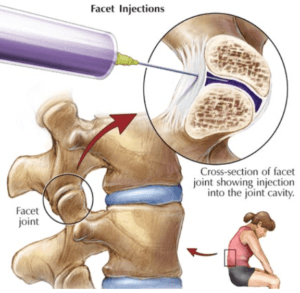 Facet injections are used to treat or diagnosis a painful facet joint in the neck (cervical), mid back (thoracic), or low back (lumbar). Each motion segment in the spine consists of a disc and two facet joints which connect and provide motion between two adjacent vertebrae (spine anatomy). These joints can develop degenerative changes over the years which may include disc herniations and facet hypertrophy (overgrowth), spur formation, synovitis and cyst formation. These degenerative changes can produce arthritic back pain or they may impinge nearby nerves causing neurologic pain such as sciatica (see image 1). Figure 1 Axial (top down view) demonstrating arthritic facet joints with hypertrophy (facet enlargement), spur formation, synovitis (joint inflammation), and cyst formation with compression of nearby nerves. The arthritic back pain produced by facet degeneration is thought to be worse with extension based activities including standing and improve with back flexion. This pain can be treated by injection the inflamed facet joint with a corticosteroid. The procedure is done with xray (fluoroscopy) to confirm the needle is properly placed at the specific facet joint of concern. Once the needle is positioned a contrast dye is injected (patients with contrast allergies should not undergo this procedure) to ensure flow into and along the facet joint (Figure 2). Figure 2: Schematic diagram illustrating facet injection with needle placed within the synovial facet joint. Multiple injections may be necessary to adequately decrease the local inflammation and resolve the associated pain. Once the pain is better controlled patients resume an exercise regimen to increase spinal motion, strengthen the core, and improve aerobic conditioning. Epidural injections are performed to decrease pain related to inflammatory degenerative changes in the neck (cervical), mid back (thoracic), or low back (lumbar). Each motion segment in the spine consists of a disc and two facet joints which connect and provide motion between two adjacent vertebrae (spine anatomy). These joints can develop degenerative changes over the years which may include annular tears, disc herniations, facet hypertrophy (overgrowth), spur formation, synovitis and cyst formation and ligamentum hypertrophy. These degenerative changes can produce arthritic back pain or they may impinge nearby nerves causing neurologic pain such as sciatica (figure 3). Figure 3. Illustration demonstrating degenerative changes of a spinal motion segment including disc degeneration, facet arthritis, bone spurs and resulting nerve compression. 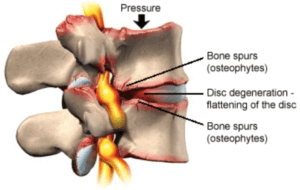 Many studies have demonstrated disc degeneration (such as a fissure, tear, or herniation) or secondary changes from disc degeneration (such as herniation, spur formation, spondylolisthesis, spinal stenosis, and nerve impingement) is the major source of most spine related complaints. These degenerative changes are driven by pro inflammatory molecules produced by the disc itself (i.e. TNFa, IL1b , PG2). These molecules stimulate a robust immune response further amplifying the inflammatory cascade resulting in increasing pain and degeneration. Epidural steroid injections are helpful because they deliver a strong anti-inflammatory agent (a corticosteroid) directly at the source of inflammation. The epidural injection is an outpatient procedure that involves placing a needle at the pathologic (symptomatic) level. Fluoroscopy (xray) is performed to ensure the needle is in the correct location and a dye is injected to confirm flow along the effected disc and nerve. A combination of short term (lidocaine) and medium term (bupivacaine) blocking agents and corticosteroid (Betamethasone, Triamcinolone, or Dexmethasone) are then injected. Patients are sent home after a short observation period and instructed to gradually resume activities as tolerated (see the Spinal Injections Handout). Multiple injections may be necessary to adequately decrease the local inflammation and resolve the associated pain. Once the pain is better controlled patients resume an exercise regimen to increase spinal motion, strengthen the core, and improve aerobic conditioning. Multiple complications have been reported including but not limited to infection, dural leak, meningitis, and nerve injury and risks are measurably higher with cervical epidurals. Patients should follow up within 7-10 days for reexamination and contact treating MD for any new or worseining symptoms. Schaufele MK, Hatch L, Jones W. Interlaminar versus transforaminal epidural injections for the treatment of symptomatic lumbar intervertebral disc herniations. Pain Physician. 2006;9:361–6. Riew KD, Yin Y, Gilula L, Bridwell KH, Lenke LG, Lauryssen C, et al. The effect of nerve-root injections on the need for operative treatment of lumbar radicular pain. A prospective, randomized, controlled, double-blind study. J Bone Joint Surg Am. 2000;82-A:1589–93.